After the completion of our latest production by the International Theatre in English at the Stadsschouwburg, "The Ingenious Mind", our next project is the Acting Masterclass. Once you have registered by completing the payment, please fill out the form below so we can add you to the PARTICIPANTS mailing list. Theodora will send out an email, with detailed information and the scenes we will be working on, second week of April. We will put the theory in practice by "workshopping" scenes from Euripides' "ELECTRA". On January 8 & 9 The International Theatre in English and the Stichting Theodora Voutsa Productions will present the production of "The Ingenious Mind" at the Stadsschouwburg in Amsterdam. The cast is a combination of professional actors and participants of our workshops. To be an outstanding professional you first need to be an outstanding human being. Learn the keys to success using Acting and Personal Development Techniques. This two day training is a great opportunity to get insight, to understand and to improve the "Roles" you play and why. This training goes further than the standard presentation. We will work on theory, experiential exercises, performance and more. Are you having trouble "nailing" these auditions? Are you not comfortable when interviewing for a new position or job? Do you feel awkward when you claim what is yours? Feel bad about it or not even try at all? Do you feel uncomfortable connecting with others and networking? Do you hesitate to promote your work and yourself? Do you sometimes feel that you are just reacting to circumstances instead of creating them? Learn how to make things work out for you! of the movie that is your life! I am not promising you that I can teach you Acting in a two day training. 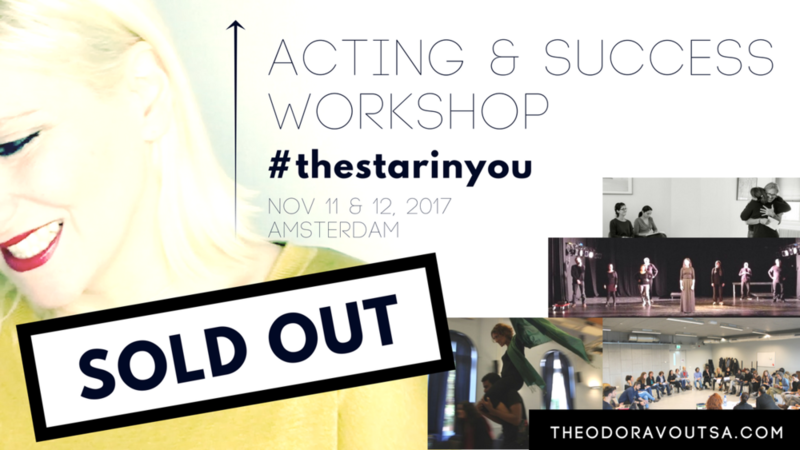 But I am promising you that I can give you the tools- and show you how to use them- so you can be an extraordinary ACTor. Learn how to play the role you want and deserve to play in life beyond confining convictions and fears. During the two day workshop we will deal with both personal traits and performance skills. Because being an outstanding professional involves what you do in your everyday life, 24/7. Time: From 11 am to 5pm. There will be break for lunch. You can get lunch at the venue, at the restaurants close by or bring your own. Location: Comedy Cafe | IJdok 89, 1013MM, Amsterdam. Investment: Early Bird Price: €222 (including VAT) | Early bird price valid until Oct 30th. Take your Livestream from zero to HERO!